This is a very small square full of history and good street music artists and has also been a filming location for various movies. Let’s take it back to the Civil War; the name of this square comes from a church called Esglesia de Sant Felip Neri (in Catalan), which was actually used as a refuge for evacuated children. On the 30th of January of 1938, a bomb was dropped by Franco which exploded directly in front of the church and killed 30 children. The traces of the bombs are still left on the walls of the church which in some way teletransports you to that decade and gives you a feel of how much fear and pain all the families lived in. Seems I am not the only lover of this square — they say Antonio Gaudi frequented this place often. Being a very religious man, he used to go to this church daily. 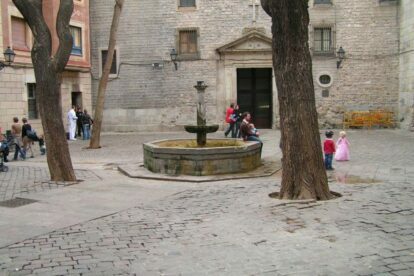 The square has appeared in movies such as Vicky Cristina Barcelona and even video clips such as My Immortal by Evanescence. It’s a perfect place to stop by if you are walking around the Gothic quarter to just unwind while you watch the world pass by you — from tourists posing for a picture, to the kids playing around. Or, if you’re lucky enough, you might encounter a street musician and get lost in the rhythm.